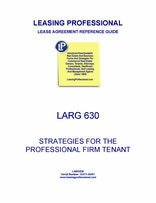 Factors Unique to the Professional Firm Office Tenant, An Office Lease Check List for the Professional Firm, and the Lease Clause Critique: Excerpts from a Pro-Tenant Professional Firm Lease Addendum. Greater Cash Flow Sensitivity. Many professional firms are partnership (as opposed to corporate) entities. This means that firm revenues and profits are disbursed directly to the partners or their professional corporations. It also means that such firms can be extremely sensitive to cash flow, since extraordinary lump sum payments under the lease must come directly out of the pockets of the partners. Conversely, periods of free rent can have an immediate and substantial positive effect on the cash flow of the partners. Expansion and Contraction. Such firms are becoming increasingly concerned with the right to shrink and expand their premises. A significant percentage of professional firms are project-oriented, i.e., they expand to take on large new projects, and they contract when those projects are completed. This is especially true with architects and engineers involved in construction projects. It is also becoming more common with attorneys who are litigators. When one of their clients becomes involved in a giant lawsuit (or a hostile takeover), the firm hires more litigators, or gets them temporarily from agencies that specialize in contracting out full time temporary lawyers and paralegals. Maybe such personnel aren't partners, associates, or employees of the firm, but they need space when the wagons are circled. The Night Shift. Lots of professional firms now work night shifts, especially attorneys with large word processing departments turning around documents and other work for the attorneys on the day shift. This means that the landlord had better be ready to provide office building services such as heating, ventilating and air conditioning around the clock. Likewise for elevators, security, lighting and parking garage operation. This also means that such firms are becoming experts at the various extra charges different office landlords impose for services provided during such "non-standard" hours. In many cases, lawyer tenants paid little attention to lease language imposing extra utility charges for extended hours of operation. Those extra charges turned out to cost real money. In the future, they'll pay attention to the innocuous sounding section in the lease entitled "Building Services." Who's in Charge Here? Professional firms are often made up of highly educated individuals with intense personalities. In many cases, especially with decisions that involve big dollars (like a new long term office lease for the firm), the partners disagree about the best course of action. This can make negotiations with such firms difficult for the landlord, who may be negotiating with several different partners simultaneously. Even worse, professional firms can break apart when the time comes to execute the new lease, because a cadre of unhappy partners is unwilling to be responsible for new long term obligations. Such dissolutions often come after months of negotiation with the landlord.